You don’t get to celebrate a sports title coming to your city every day, every week, every year and in some cases, every few decades. 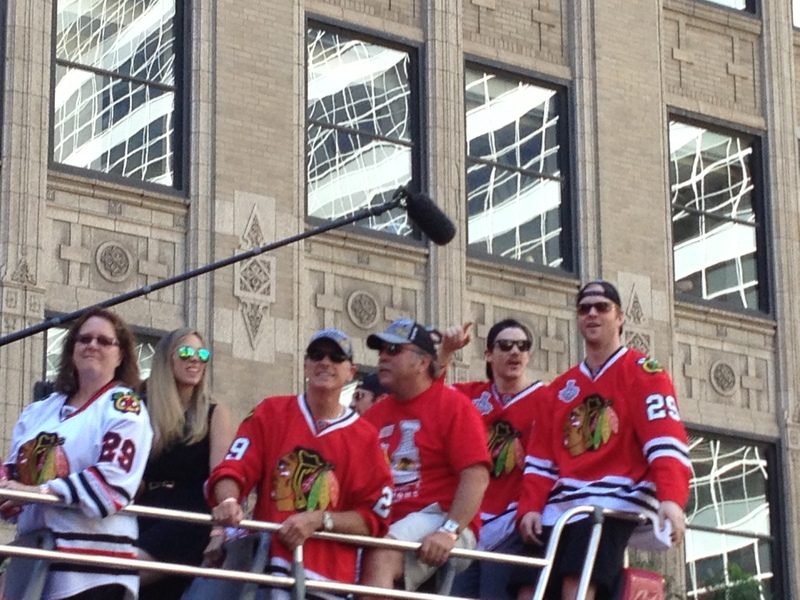 That’s why as I took a few hours out of my day to savor the importance of celebrating this moment with the NHL champion Chicago Blackhawks’ Stanley Cup parade, I considered the hundreds of thousands of people who had joined me. It’s what I’d call a Retention Moment: These special moments where you supply and support your people through a surprising “extra” that caters to what they truly value most in life. Not what you think they want or think they would like, but what you definitely know they want. Today it was related to sports. But other examples can relate to spending more time with family, getting tuition reimbursement and so much more. A lot – especially in the way of internal branding. You don’t build employee advocates of your company just because you gave them a raise. You build up that loyalty by understanding what makes each person tick and then giving them an easier path to celebrating more of what they value in life. I know how much you value time with your family and it’s been so hard to get everyone together in your house to take a true vacation. Here’s an extra $_____ to enjoy yourself on your vacation. Have a great time. If you’ve ever seen the end of each episode of “Undercover Boss,” you know there’s a moment where an act the boss does leaves that employee in tears of gratitude. Why? Because the boss recognize their challenges as much as their accomplishments and he actually does something about that. It takes a special kind of person to reach this level. It’s a leader who wants to be there for his people because he cares about them. He knows that it’s pointless to expect them to fully productive at work if there’s traumatic issues at home. He helps them free of expectation, because it’s the right thing to do. Who leaves an environment like this? Unless the role is menial, it becomes incredibly hard to – and that’s a very unlikely scenario because a boss who doesn’t care about the employee’s role isn’t suddenly going to shower them with rewards to try to bribe that employee to stay. No, when you reach this level, you’re the genuine article as a boss and an overall human being. To recognize our win of the Chrysler account. I am sending along a message via e-mail to our top brass mentioning the people on the team by name. Because without them, we never would have won this. I’m also taking our team out tonight to a nice restaurant to celebrate the moment. Recognition of individual team members and celebrating every important win. It takes nothing but it’s still not always done. You shoot off an e-mail pointing out their specific achievements. You give an internal award (which doesn’t have to be financial). You frame their picture or images of their work. You savor the victories and make sure it’s a shared one. The more permanent these acts, the better. The more frequent these acts, the better. If you last celebrated a win 6 months ago, you’re missing Retention Moments. A company at this level doesn’t. Ever. Sometimes they don’t even need a reason for celebrating other than the fact that it brings people together. There’s a championship parade downtown. Anyone who wants to go watch it can feel free to do so. This is a great thing for our city and I know many of you are fans. You will be paid for this time off and it will not infringe on your vacation/sick days. This is still unexpected. Not everybody may want to go take advantage of this offer, but it doesn’t really matter. The leadership put it out there and that’s what counts. It’s not celebrating the individual but it’s still something the company can take advantage of. Well, Frances, the bitter and jaded Office Manager who’s 1 year away from retirement, may have an issue with it because she doesn’t like sports. Oh, lighten up, Frances. A company at this level actually cares about following through to help the individual reach their goals – not in a way that tries to weed out underachievers but in a way that tries to bring out the best in people. They actually look forward to this planning with their employees – and beyond the talk, there’s action and evidence that the employee gets to where they want to go. Whether moving up means a promotion within the department or moving to another part of the company entirely, there’s a mutual dedication to maximizing the company’s talent in the right place. It’s that time of year. We have to do an Individual Development Plan. Let’s sit down Friday and think of 2-3 goals you want to achieve. You’ll be expected to reach them next quarter. Or maybe that was within the next year. I can’t remember. Anyway, we’ll talk more and figure it out. This is the average and expected. Many companies fall into this category and wonder why they don’t have more of a culture. Boss and employee sit down, review goals, critique, move on. They’ll remember it two weeks before they have to talk about it again. So what are the chances that this employee feels their work is being valued when talk of their development is treated like a chore or afterthought? Not much. Retention Level 1: Why Hasn’t My Own Statue Hasn’t Been Built Yet? I’m a terrific boss. I’ve been in this business for many years and everyone should be glad to be working here for me. I give them a job, a desk, a paycheck, a decent amount of time off and the ability to work on great accounts. If someone doesn’t like it, they can leave. Egomania, ahoy! It’s all about him. Not his team. He thinks he’s the gift from above and all his minions should be happy to work in his presence. You’ve got to be kidding. While he’s imagining the documentary HBO is going to film about his life’s story, his employees are updating their resumes and portfolios to get the hell out of his environment tomorrow. But of course, in his view, they’re totally replaceable anyway. It’s a wonder he even knows all of their names – and in fact, he may not. It’s his world and they’re just living in it. Where are you on this scale? How can you move up? As you can guess, the manager who looks outward rather than inward, has greater humility than ego and takes the time to understand what his employees truly value rather than assuming it’s all about raises, bonuses and merely earning a paycheck can be the foundation of a better culture. That better culture can breed more brand advocates. You’ll also notice the scale moves upward from one manager thrilled with his own greatness to that manager striving to understand what makes each individual person happy (and supporting that in a selfless, compassionate way). People who are happier, more challenged and rewarded in a customized way are more productive people. These elements are related in building the brand within – don’t kid yourself in thinking otherwise. If you’re in any kind of position of influence, the momentum to move your company up the scale just may start with you. That’s worth parading about town over.